This entry was posted in English Football League One and tagged Vandanel on May 17, 2012 by Football Kit News. This entry was posted in English Football League Two and tagged Vandanel on April 10, 2012 by Football Kit News. This is the new Yeovil Town Home Kit 11/12 that League One side Yeovil Town will wear in their home games during the forthcoming 2011/2012 season. 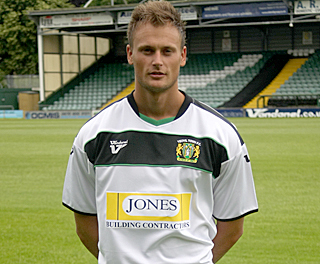 The new Yeovil Town kit 11/12 has been manufactured by Vandanel and was released on June 8, 2011. This entry was posted in English Football League One and tagged Vandanel on June 9, 2011 by Football Kit News. This is the new Port Vale away kit 11/12, unveiled by the Staffordshire club and their kit partners Vandanel. Port Vale finished 11th in English League Two during the 2010/2011 football season. The new Port Vale away strip is a charcoal grey kit with black and amber trim as can be seen from the photo of the strip modelled by Louis Dodds below. Harlequins Property are the sponsors of the new Port Vale away kit 11/12. This entry was posted in English Football League Two and tagged Vandanel on June 3, 2011 by Football Kit News. League One side Yeovil Town Football Club will wear this Vandanel strip for their games away from Huish Park in the 10/11 League One season. The new Glovers away kit marks a radical change from previous change strips that were usually dark in colour. The away shirt is primarily white in colour, with a solitary horizontal band down the centre containing the logo of kit makers Vandanel and the club crest. The sponsors of the shirt are Jones Building contractors. The name of the Yarlington Housing Group is seen on the backside of the shirt below the collar. The shorts and the socks are both black in colour. This entry was posted in English Football League One and tagged Vandanel on July 25, 2010 by Football Kit News.